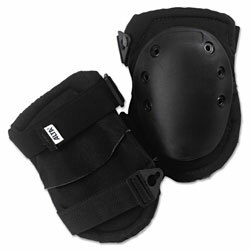 Durable knee pads have long, soft rubber caps for traction and maximum surface coverage. Neoprene foam padding provides consistently firm support. Convenient, original AltaLok™ easy on/off fastening system. Knee pads are adjustable to fit most sizes. Cordura® Nylon cover provides comfort and finished brushed tricot liner keeps out moisture and debris. Six brass grommets firmly secure the pads. Elbow/Knee Pad Type: Knee Pad; Size Group: One Size Fits All; Closure Type: Six-Point Grommet Fastener; Material(s): Neoprene/Nylon; Rubber. Knee Pads from Alta! 328 In Stock today.